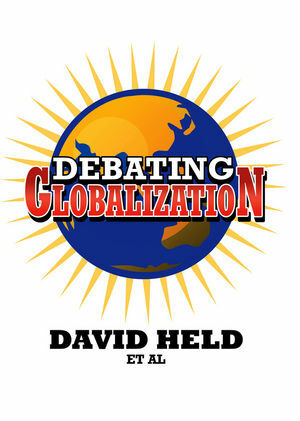 Debating Globalization is a short, accessible introduction to the debate about globalization written by many of the most prominent figures in the field. Published by Polity in association with openDemocracy, the book is notable not just for focusing on the pressing difficulties facing our world, but also on solutions. Rich and positive suggestions are made for reshaping globalization into a force that will work for humans everywhere. In an extended analysis, David Held provides a robust critique of the present order and sets out his alternative vision. Building on arguments he made in Global Covenant, he calls for a new global political agenda, informed by social democratic political values. His analysis has been criticized by leading figures and their responses follow in this book. There are chapters by, among others, Martin Wolf, Roger Scruton, Grahame Thompson, David Mepham, Meghnad Desai, Maria Livanos Cattaui, Patrick Bond, Benjamin Barber, John Elkington, Takashi Inoguchi, Narcís Serra, and Anne-Marie Slaughter and Thomas N. Hale. The volume ends with David Held's reply to his critics. The book provides a fascinating introduction to the debate about globalization today. David Held is Graham Wallas Professor of Political Science, London School of Economics and Political Science. Preface by Anthony Barnett and Casper Henderson. Introduction by Anthony Barnett and Caspar Henderson. 1. Globalization: The Dangers and the Answers. 2. The Case for Optimism. 4. The Limits to Globalization. · 5. The Far Side of Globalization. 6. Social Democracy as World Panacea. 7. The Test of Practice. 8. Top Down or Bottom Up. 10. Three Modes of Order. Anne-Marie Slaughter & Thomas N. Hale. 13. America, the UN and the World. 14. What are the Dangers and the Answers?. The New Human Security Doctrine. Mary Kaldor & Marlies Glasius. "The essays in this volume offer spirited engagement with Held's The Global Covenant, which is summarised at the start of this one as the point of departure for the debate ... The line-up of contributors is unquestionably impressive and diverse, and without exception the essays are lively and well written." "Debating Globalization assembles leading scholars to rethink the logic and consequences of globalization. Held and his colleagues wonderfully illuminate the great forces that are transforming modern life." "This brilliant book succeeds in bringing together two major issues normally isolated in the international agenda: security and development, security and the human rights agenda. Essential reading for students and policy-makers alike." "This book should be compulsory reading for governments, researchers, and social justice activists. The contributions address what is arguably the single greatest challenge of our age: the unstable co-existence of mass poverty in the midst of global prosperity. Avoiding simple blueprints, the book makes a compelling case for a new pattern of globalization and an end to "business as usual" global governance." Written by many of the most prominent figures in the field, including David Held, Martin Wolf and Kofi Annan. The book follows the format of a lively debate, and thus offers sharp summaries of its authors' views. The debate is notable not just for focusing on the pressing difficulties facing our world, but also on solutions.